In a medium sized cast iron skillet, heat the olive oil over medium-high heat. Add in the onions and stir to coat evenly with the oil. Cook for five minutes, stirring occasionally. Add salt, and cook for another five minutes, stirring occasionally. Reduce heat to medium-low and continue to cook for 25-30 minutes, stirring every five minutes or so, until the onions are a deep golden brown and caramelized. Add the smashed garlic and 1/4 cup olive oil to a small 6-inch skillet. Put over low heat and let cook for 10-15 minutes, stirring the garlic every two to three minutes. Be sure to keep a close eye on it, making sure the garlic doesn't burn. The end result should have the garlic be lightly golden and toasted. Remove from heat and let cool. Strain the oil into a small bowl. Store the fried garlic in the fridge for another use or save it as a pizza topping for a more intense garlic flavor. Preheat the oven to 400 degrees Fahrenheit. Lightly brush the pizza pan with a little bit of light olive oil and set aside. Remove the puff pastry from packaging and unfold it. Place the puff pastry onto a floured surface and lightly sprinkle the top with a little more flour. Shape the pastry into a 14-15 inch circle. You can do this by a combination of folding in the corners, using a rolling pin, and stretching by hand. Gently place the puff pastry onto the greased pizza pan and brush with the garlic-infused oil. 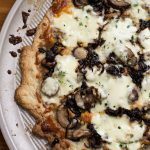 Top with half of the shredded mozzarella, then add the caramelized onions and mushrooms. Top with the remaining shredded mozzarella or to taste. Top with a handful of small dollops of mascarpone. Place onto the center rack in the oven and bake for 15-20 minutes, until the bottom is golden brown. Remove from the oven and let sit for five minutes. Garnish with some fresh thyme. For a more intense garlic flavor, top with the fried garlic from the garlic-infused oil recipe. Defrost your frozen puff pastry in the refrigerator overnight and be sure it's completely thawed before using. Leave in the refrigerator until you are ready to roll it into a pizza, as letting the dough get too warm will make it more difficult to shape (especially if you're using an all-butter puff pastry, like Dufour). Add mascarpone to taste; I found using less than half of an 8-ounce container is a good amount. Adding more could make the pizza a little rich.